Pumpkin is such a versatile ingredient that I like to incorporate it into all kinds of baked goods in the fall and winter. Pumpkin pies are always a hit, but there are times when I prefer to bake cookies, since they’re easier to transport and serve to a crowd. These White Chocolate Chip Pumpkin Cookies with Marshmallows are a fun chocolate chip cookie variation loaded with sweetness and spice that is perfect for any fall occasion. Most pumpkin cookies are cakey. Cakey cookies are an excellent choice for whoopie pies and sandwich cookies, but I prefer my chocolate chip cookies to have a chewier texture and a slightly crisp edge. While this recipe contains plenty of pumpkin, they are still wonderfully chewy, with a crisp edge that contrasts well with the soft marshmallows and creamy white chocolate in each one. 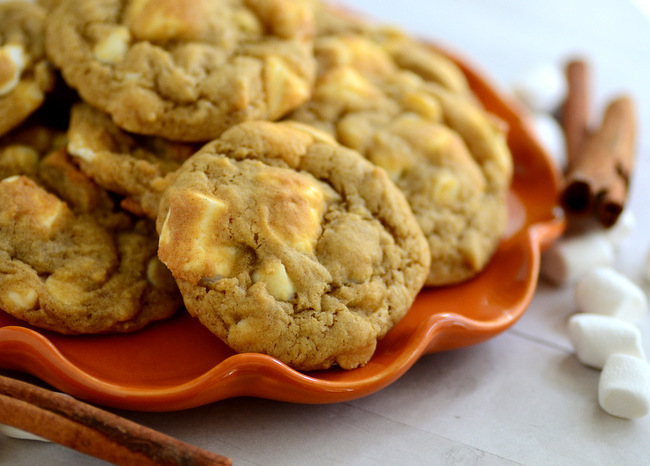 I find that white chocolate is actually a great match for pumpkin spice in this recipe. While you could substitute in regular chocolate chips, the deep cocoa flavor of dark chocolate tends to take over the cookies and leave you with more chocolate than pumpkin in each bite. White chocolate, on the other hand, brings in a creamy vanilla sweetness that contrasts well with the cinnamon and other spices in the cookie dough. You’ll be able to taste all of the spices and the pumpkin alongside the white chocolate. You’ll get the best results with real white chocolate that is made with cocoa butter, rather than other vegetable fats, as real white chocolate chips are much creamier and less sweet than the “vanilla-flavored chips” you can buy. I added the marshmallows to the cookies on a whim and I loved how they turned out. They added just the right amount of extra caramelized sweetness and a nice extra chewiness to the cookies. Be sure to use mini marshmallows, as they full sized marshmallows are just too big for this particular recipe. The cookies will keep well for several days after baking, as the pumpkin brings in just the right amount of moisture to keep them from getting stale quickly. They will remain chewy, but will loose the crispness around the edge when stored in an airtight container. I still think they’re delicious and have even been known to double this batch just to ensure that I have some leftovers after a big party. Serve them with coffee, tea or hot chocolate as a treat for yourself if you’re not entertaining! In a medium bowl, whisk together flour, spices, baking powder, baking soda and salt. Shape dough into generous 1-inch balls and arrange on baking sheet, leaving about 1 1/2 inches between each cookie to allow for spread. Bake for 10-12 minutes, or until cookies are set and very lightly browned on the edges. Allow cookies to cool for 4-6 minutes on the baking sheet, before transferring to a wire rack to cool completely. I love white chocolate cookies! And the combination with pumpkin sounds yummy! Can’t wait to try this recipe!